Another Book Club down and this one consisted of a rather large amount of ACTUAL discussion of the book!! For those who aren't a part of a book club (you're really missing out!) some books lend themselves to conversation more than others...and sometimes you have more real life excitement to dish than normal...so the amount of time spent speaking about a book can vary greatly from month to month. I've been in clubs where we've had pre-planned questions, and others where the flow and topics were very on the spot. I don't think any one is better than the other, as long as everyone has read the book and is game for a little bit of analysis. 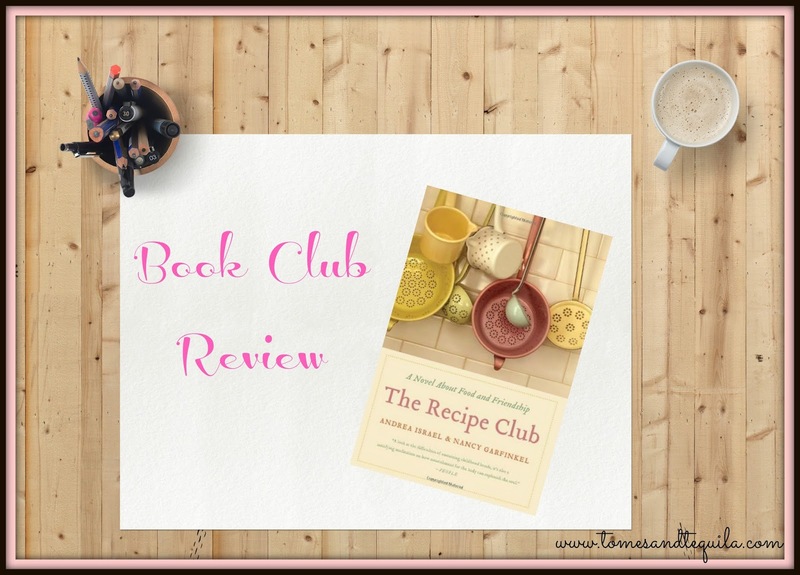 As for the book I read with the neighbor gals this month, The Recipe Club by Andrea Israel and Nancy Garfinkel, I think the conversation was better than the book, although it wasn't bad. I think the other ladies liked it a bit more than I did. But I give the book conversation an A+!! And the recipes that my friend Michele made from the book were terrific, so that's a big plus also. The Recipe Club was the story of Lilly and Val, two friends from childhood. It is told in the form of e-mails and letters between the two, with the last couple of chapters written like a normal story (for lack of a better phrase). Peppered throughout are recipes sent back and forth between the girls for their Recipe Club. You are told in the beginning that something happened that broke their incredibly tight friendship up, and then go back in time to see how close they were in the past...then returned to the future for a resolution. There is an intense co-dependency in these girls who both live in dysfunctional homes and rely on each other, in completely different ways, for the affection they aren't receiving from their parents. The adults in this story were in a few cases not fleshed out fully and in others either completely unlikable or just so wrapped up in their own drama that they were unable to parent the girls...something a few of us could relate to in our own lives. Had the writing been a bit better, this book could've been extremely good because it brought up all sorts of great talk...from first sexual experiences and our own families, to whether we were more like Val or Lilly. It seems like a lot of girls relate to one of these stereotypes. Polar opposites, Val being very smart and conservative, nerdy to a fault and Lilly being wild and experimental, always out there trying new things...the life of the party, it's a good example of opposites attracting and how, when not in the throws of dysfunction, in a relationship like that you can bring out the best in each other and grow to be better and more well-rounded people. But it was very interesting to see how a friendship could grow and morph from early childhood through, I believe we figured they were in their 50's at the end of the book. I think I'm going to give this one 3 Stars. The writing wasn't quite up to snuff for me. The girls didn't have unique enough voices to really know who was writing without seeing a signature, plus they didn't write like 8 year olds in the beginning...or grow as it went along. I think some of my issues also stem from reading the Kindle edition, as formatting could be a problem with a book like this. I noticed the paperback had font changes that might've helped a tad. But it was a great book to discuss with friends, so not a waste of time by any means. Do you enjoy books written in the form of letters or emails? Have a favorite book about friendship? Let me know in the comments here or over on my Facebook page.